Living life on life’s terms. It’s a slogan and it’s also a fact. It’s also easier said than done for me sometimes. In life we all have our ups and downs. No one is always going to have good days without the occasional obstacles, hiccups, pain, suffering or just plain old everyday drama. The same can be said about having bad days. They might seem like they will never end but eventually they do and life returns to whatever is normal. In my short time in recovery. I have met some people who deal with life’s terms very well. They have what seems to be a handle on things and can deal and heal and keep it moving. I have also met people who cannot. They always seem to have something or another going on and they do not seem to handle it very well. That’s not to say they use. (Some do, some do not). Some people live to cause drama, and they might or might not even realize it. I think they do but they act as if they don’t. I like to think that when problems arise in my life that I am one of those who handles it and can deal and heal and move on. In reality that’s not always the case. I can present the image that I am alright but deep down inside I am not. I’ve always been able to mask my true feelings. I guess it’s because I am a people pleaser. I always try to make others happy. Even at the expense of my own happiness. Well lately its been making me uncomfortable. I am sacrificing my happiness for others. I have a problem with expressing myself when I am unhappy and just like in the past either I get angry or I stuff it and say nothing. In the past I used drugs to make it go away. (Or so I thought). But it never really goes away. Today I don’t use so I have to learn how to deal and heal because It turns into resentment. Resentments kill if not addressed. 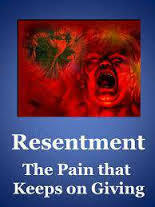 Today I will choose to address my resentments and attempt to do so in a healthy manner. I will ask for help and guidance from my sponsor and network. 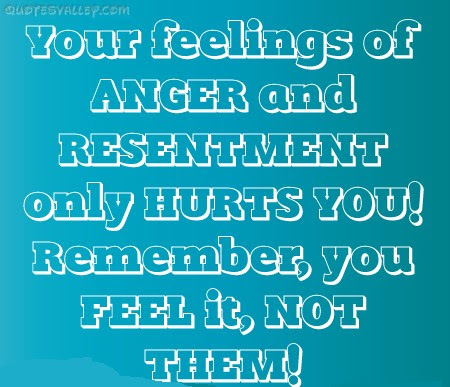 Holding onto anger and resentment is like peeling on yourself because only you can feel it and when you’re ready to stop feeling wet you will stop holding on to it. Good post. Exactly. Thank you. Let go and move on.